Donovan is painting near the corner where the two walls meet. 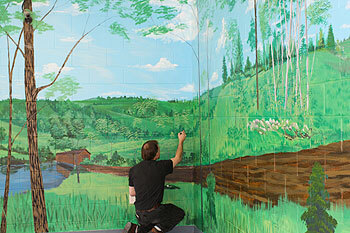 Steven Donovan, artist and muralist, recently completed a landscape scene covering two walls in the waiting room of the Transportation Center. He said, "My murals allow you to forget your woes and wander around in the landscape. I can create scenes or landscapes resembling places that you may have seen or have yet to see." He and representatives from the Brattleboro Town Arts Committee's Transportation Center Art subcommittee invite Gallery Walkers to view and "wander around in the painting" on Friday, February 5, from 5:30 to 8:30 p.m.
A view of the larger landscape as its designer, Steven Donovan, adds details. Donovan began painting in 1985 and in the last three years has painted twelve murals, four of which are painted on windows. His largest mural covers the north wall of the Turning Point building on Elm Street in Brattleboro. He states, "I have gifted or donated more paintings than I have sold; I get more pleasure in painting for others rather than myself." His goal is to paint murals in lobbies and waiting rooms. The mural represents the last step in a process begun when the Brattleboro Arts Committee (TAC), formed in 2008, was directed by the Town Planning Department to create an Art in Public Places Policy. The Brattleboro Selectboard approved the policy, and the Art at the Transportation Center subcommittee was created to publicize the mural project, develop an application process, solicit donations of paint and materials, jury applicants, and cheer on the artist. Donovan donated over 40 hours to the project, Sherwin Williams and Brown & Roberts donated paint, and Carley's Florist loaned the trees which enhance the atmosphere of the waiting room. Six months from now, Donovanís mural will be painted over, and another artist or group of artists will have the opportunity to create art on the walls. Judy Zemel, TAC member and Chair of the Transportation Center Subcommittee states, "This beautiful mural will exist for six months, and while it will be hard to let it go, something new and wonderful will replace it. Temporary exhibits rather than permanent displays keep the space interesting and will provide opportunities for a variety of individuals and groups to paint murals for our enjoyment."